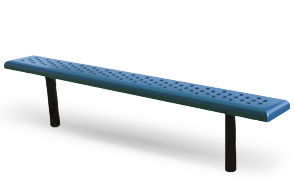 Commercial quality sports bench available in lengths up to 15 feet on select styles. The steel seat is available with a diamond mesh pattern or with small perforated circles. The MCA treated wood seat prevents decay and insect damage. Mounting options include embedding the in-ground mount bench into a surface such as concrete or surface mounting the portable style to a flat surface to prevent theft. This sports bench has a backless style so it can be enjoyed from either side. Use it outdoors with confidence.